One of several cameras was set to a wrong date? The time was slightly off? – So the resulting media are unsorted and all over the place? 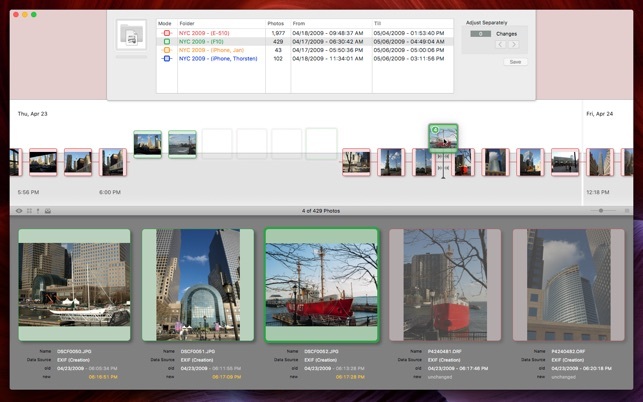 ShootShifter presents photos and movies in chronological order on a graphical timeline or grid. Date and time changes can then be applied with several tools to individual files or even complete folders. E.g. it is possible to directly enter new dates and times, or to simply move the thumbnails around on the timeline, etc. Using the fullscreen preview and its related features, one can get a great overview over all the media and already here get rid of the least successful ones. At the end the files can be renamed with standardized filenames using the user-configurable naming templates. • View files in chronological order on timeline or fullscreen grid, additional bigger previews and the info popover show more details. • Select the appropriate source time zone for folders or single files (if it differs from System). Date and time will still be displayed converted to system time, but now using the correct "source data". Saving date/time modifications is possible using system or the source time zone (or even another different one), as required. • Modify dates and times on single files or complete folders at once: Enter new values or simply move thumbnails by drag & drop or keyboard shortcuts, or use the automatic realign options. 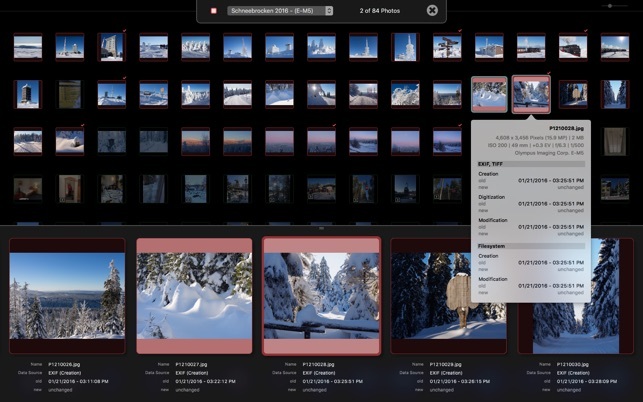 • Quick selections: select thumbnails by media and file types, data sources, camera types, locations (radii) ... and more context dependent ones like: changes, possible errors, search results, etc. Or use the map to manually find and select media based on location data. • Quick navigation on timeline and grid: Use jump markers, jump to automatic "time chapters" (e.g. next/previous day), and utilize the new "live-target" mode. • Rename files using custom naming templates, with a sequence counter per folder or spanning all folders at once, use old filename and/or foldername as the basis for new names, or set completely new ones. • View media in a fullscreen slideshow: With overview grid (as quick navigation), 100% loupe (even for movies), temporary movie bookmarks (that can be exported as "Chapter Text"), "locked random" mode (can be interrupted by non-random navigation and then reasonably resumed), etc. For quick slideshow-only usage, there is also a special express import option that skips all date parsing. 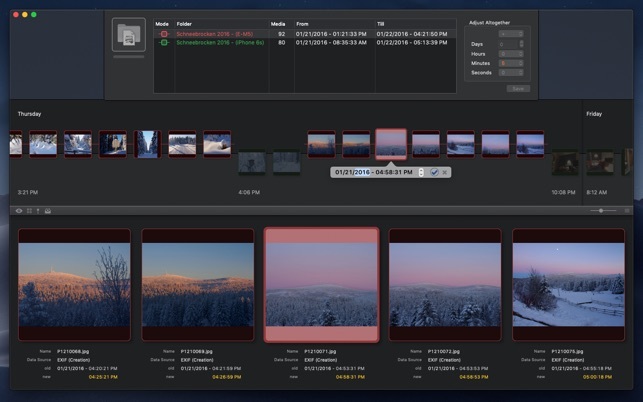 • Supports JPG, TIFF, many RAW files (using EXIF, TIFF data), QT movies (and "alikes": MOV, MP4, etc.) and some AVIs (using MDTA, MVHD or RIFF data from the movie header). 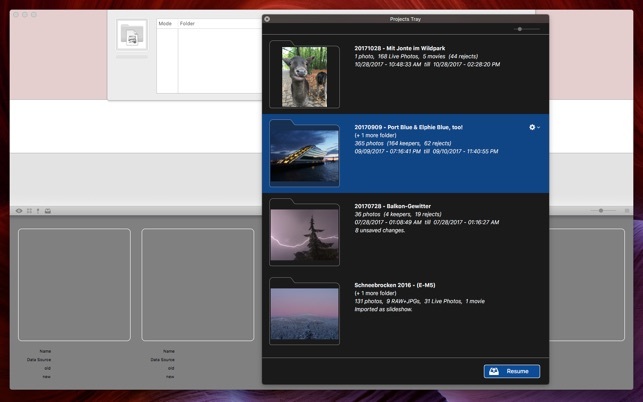 • Other file types (GIF, PNG, unsupported RAWs and movies) or files without embedded metadata will be imported based on their filesystem date/times. At least THESE can be changed and the files can be renamed, too. 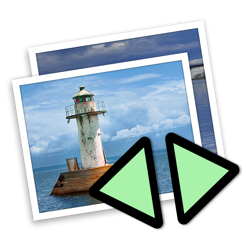 • RAW+JPGs and Live Photos can be imported as file groups, so all changes are always applied to both files at the same time. XMP and AAE sidecar files are supported, too, so these will be moved and/or renamed together with the main files, and date/time modifications can be transferred to pre-existing XMP data. * Fixes several display issues. * Fixes possible rating issues during slideshow overview. * The map could reopen inadvertently on project restore. I can use Terminal with ‘touch -t’ to change the time of my photo and video files, but what a waste of my time that is! For multiple files it would be tedious in the extreme. 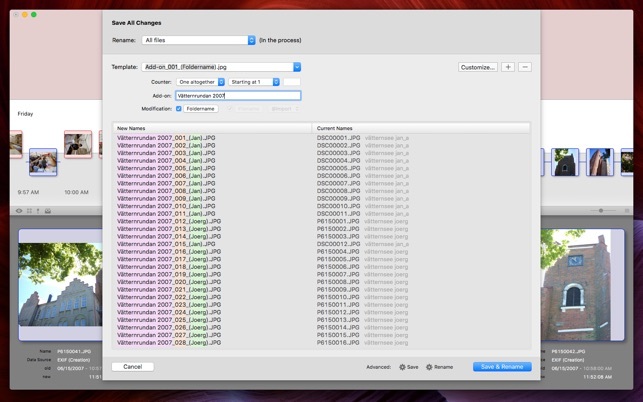 Shootshifter has a drag-and-drop timeline interface so I can easily sync up the times of different camera files. One great value is for video clips. When I have edited a video clip by trimming it in QuickTime, the saved file time is set to the time it was edited. So I need to put the file time back to the original. 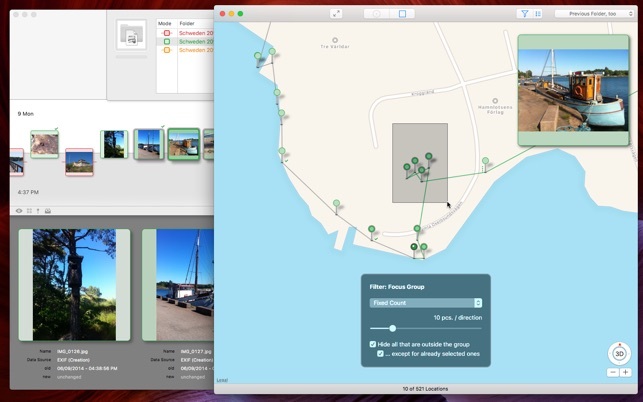 Shootshifter makes it easy to do - far easier than the editing! Sometimes (about once a year), Shootshifter stops working. After trying various approaches (e.g., restarting it), I ALWAYS find that it is cured by rebooting macOS. Apparently macOS has glitches in the file system state that affect the application. :( This is NOT the fault of the application. I use Shootshifter several times a month, and it saves time for me. I recommend it. I have been using Shootshifter since version 2 something, and I love it. The old version was so good, that I wanted to pay for it, but there was no way to do so at the time! Even though I was very satisfied with it, for some reason, I decided to check if there was a newer version, and lo and behold, there was a greatly improved one that even works with video files! A no-brainer - I had to upgrade. This software will save you so much time you will be so happy you got it. I recommend taking a photo of a watch face with a second hand with each camera you use so that you can easily sync all your photos to the times shown on the watch. I am FINALLY after years of trying and failing, getting my tens of thoudanfs of pictures in some sense of order! Over the years, THOUSANDS of pcitures have become ‘corrupted’ with dates being at times up to 40 years off. Other apps would allow me to chnage the NAMES of the pictures but would NOT allow me to alter the embedded dates. This app does allow me to alter the dates. The developer really knew what he was doing when writing this and I know I am in way over my head right now in what I actually comprehend, lol. Cannot wait to play around with this more and se what else it can do!